This Cemetery, which adjoins St. Patricks Church, was first opened in 1881. The first burial was of Andrew Hickey whose descendents are still in South Main St. It has been enlarged several times in 1914, 1945 and 1999. There are some fine memorials in the cemetery. The cemetery contains the republican plot. Seven former Parish Priests are buried here. The cemetery is set against the background of St. Patricks Church. This cemetery is the main burial place for the Parish population. 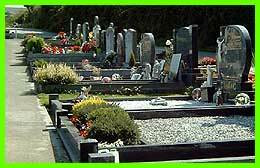 Procedures for funerals and purchasing a burial plot can be found on the funerals page. 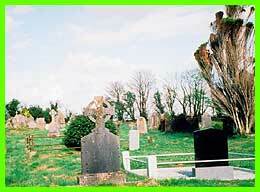 Three Miles west of Bandon in the town land of Knockaveale is a penal day landmark, namely Kilhassen chapel and graveyard. Fr. Donal Hurley was the Parish Priest here in 1704. Fr. Daniel Quinlan built an extension to the Church about 1730. There is a stone on the gable dated 1680. In 1942, Canon Scannell carried out an excavation of the site. The church walls still survive and the stone altar, credence table and safe for the sacred vessels can be seen to day. There are several uninscribed grave markers in the adjoining graveyard. This was the centre of the old parish of Kilbrogan, north of the river Bandon. Fr. Shinnick built a chapel here in 1796. The chapel was closed in the early 1920s. 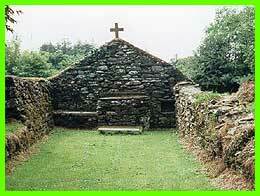 The walls of the last chapel at Kilbrogan are still standing. Tradition has it that Most Rev. Dr. Delany (1804-1886), Bishop of Cork, was born in the sacristy of Kilbrogan on Christmas Day. 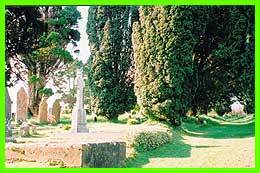 Seven Priests are buried in Kilbrogan, namely Fr. D. Quinlan (1767), Fr. J. Cunningham (1775), Fr. T. McKerns (1795), Fr. Magrath (1901), Fr. Hawkes (1811), Fr. D. O’Donoghue (1847) and Fr. J. O’Mahony (1882). Ballymodan Church stood in the old burial ground before the Reformation at the south side of the town. From aerial photographs, it can be clearly seen that this graveyard stood within an ancient round fort. The first planters of Bandon used the church before St. Peters was opened for worship in the early 1600s. Inside the gates is the resting place of Cornelius O’Sullivan who died on the 8th January 1907 at Burton on Trent. He worked for Bass and can be regarded as the founder of Bio Chemistry. There is also a stained glass window dedicated to his memory in the Parish Church. 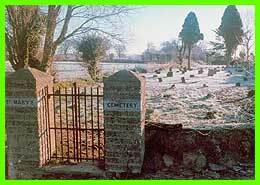 This burial ground was purchased from Andrew Brady in May 1847 by the Bandon Board of Guardians for the burial of Famine victims of the nearby Workhouse and the auxiliary workhouse at Overton Cotton Mills due to the severe overcrowding of nearby graveyards especially Ballymodan. From the records of the workhouse, at least 3,000 people are buried here. After the Famine, it was the burial place for all those who through force of circumstance had no other resting place. It was known as the pauper’s graveyard or Brady’s hole. Canon Martin Murphy renamed it St. Mary’s Cemetery in the 1930s.